Map of the medical institutions with nearby parking (red arrow) and building entrance (double red arrow) noted. 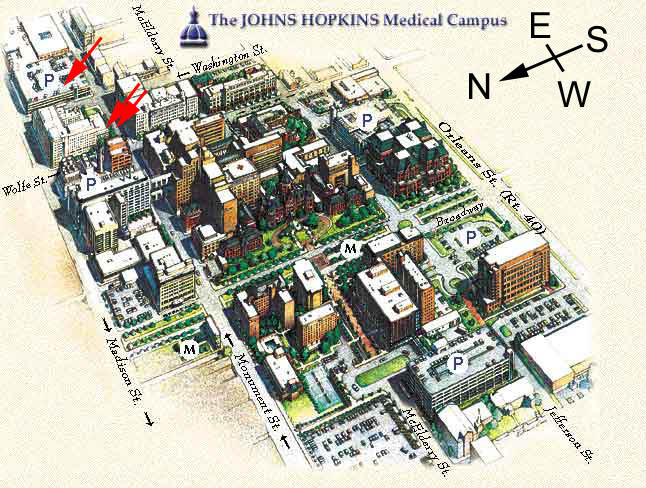 The Basic Science Complex sits between two parking structures (marked "P") at the upper left of the map. The Washington Street garage (701 N. Washington St, between Monument and Madison) if preferable. Parking is open until midnight, and is ~$5 for three hours. After you park, cross Washington Street on foot and walk west on Monument street (past the entrance to the Welch library) to reach the entrance to the Basic Science Complex on your right (north-east corner) of Monument and Wolfe streets (725 N. Wolfe St). An alternative site is the Rutland Garage with an entrance on Madison street between Wolfe and Broadway. From that structure you can enter the Basic Science Complex via an overpass on the fifth floor of the garage. Make sure to take the overpass heading east (not south) or you'll end up in the hospital.